This mini LED book light is specially designed for night readers or bed readers. You can clamp the book light on your book and choose a mode you like according to your reading condition and enjoy your reading without worrying about disturbing others. This book light has 8 LEDs. With 4 warm white LEDs and 4 white LED, it brings 3 lighting modes including 4 Warm White LEDs, 4 White LEDs, All 8 LEDs. And you will always find the suitable brightness level for different use. Short press to adjust lighting mode, long press to control brightness(stepless). 1)You do not have to frequently replace battery as this LED light has built-in 1000mAh rechargeable battery. 2)With the Micro USB cable, there are multiple ways to charge the book light such as USB charger, car charger, computer USB output, and power bank. 3)On the side of the book light, the battery indicator light will keep on while charging, and it will go off after the light is fully charged. The dual-purpose clip can stand on its own or clip on objects. You can clamp thinner objects such as book pages or thicker objects such as table edge. The clamp has been padded with soft foam to avoid damage to the surface of being clamped. 【8 LEDs, 3 Lighting Modes, Stepless Brightness】4 warm white LEDs and 4 white LEDs. 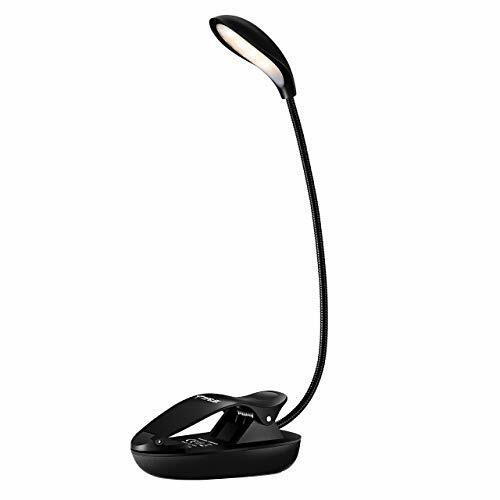 3 lighting modes evenly cast bright white or warm white light on your book or e-reader without hotspot. Short press to adjust lighting mode, long press to control brightness(stepless). Great for working, sleeping and reading. 【360° Flexible Goose Neck】The goose neck is flexible and you can put the light on right position exactly where you want. Silicone surface protects pages being clamped and the adjustable clip offers secure grip. Non-slip EVA mat on the bottom helps firmly placed on the table. 【Non-Flicker Light and Eye-Protection】The book light with energy-efficient and eye-caring LED creates soft and natural light that doesn't hurt eyes. There are numerous brightness levels for choosing. You the adjust the one that fits you best. 【Rechargeable Lithium Battery】Built-in rechargeable lithium battery brings up to 60-hour lighting time under full charge. And the charging indicator clearly shows the charging status to avoid over charging. 【Compact and Portable】The USB book light is in mini size and comes with a storage bag for easy carrying. You can take it anywhere you go. It is lightweight enough for easily fitting in your briefcase, purse, backpack or luggage.